This creams formula combines marine and botanical active ingredients known for their lightening properties to help reduce pigmentation marks. Recommended for spot treatment of pigmented areas. To lighten pigment spots: Apply Crème PIGM 200 in the morning and in the evening on the spots after using Lotion Alpha Kérato-Régulatrice. Use a sunscreen for the duration of the treatment and for 2 to 3 weeks afterwards. We recommend alternating Crème Placenta with Crème PIGM 200 to treat skin pigmentation problems. This cream is formulated with a dynamic combination of marine and botanical active ingredients renowned for their unifying properties. Apply Crème PIGM 400 in the morning and in the evening on the spots after using Lotion Alpha Kérato-Régulatrice. Use a sunscreen for the duration of the treatment and for 2 to 3 weeks afterwards. 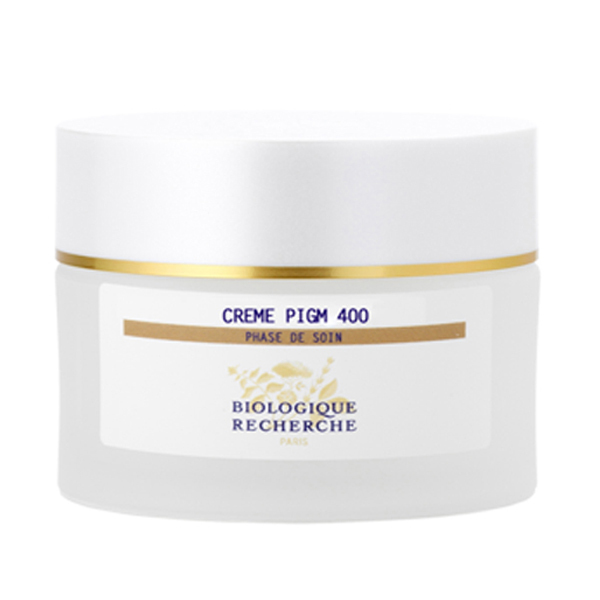 We recommend alternating Crème Placenta with Crème PIGM 400 to treat skin pigmentation problems.